It’s Saturday, time for another Inspiration Challenge on Splitcoaststampers! The inspiration site for today’s challenge IC343 is Denizmom’s Etsy Store, which sells Amigurumi patterns and dolls. For my inspiration piece, I chose this darling little frog. It reminded me of the little tree frog that lives in our front yard. Most days you can find him on the ceiling of our front porch. In the evening, I often see him on the palm frond outside my studio window. I don’t have a frog stamp that I liked for this challenge, so I searched for tree frog coloring pages. When I found this one, I decided to combine this challenge with yesterday’s Splitcoaststampers Free for All Challenge F4A123 What a Load of Scrap! The challenge was to use paper scraps from your desk to create an interesting background. I gathered up all my green scraps and cut strips to represent the palm frond. I glued them to a scrap of cardstock and then used a ruler and Wild Wasabi marker to draw the lines. I colored my frog by first using a Real Red and Basic Black marker for the eye and Barely Banana for the belly. I then sponged Tangerine Tango on his toes and Lucky Limeade on the body. I meant to leave the belly Barely Banana, but got Lucky Limeade on it, so that was it for that idea. Next, I cut the frog out, covered it in VersaMark and heat embossed with clear embossing power. I stamped Hello from Stampin’ Up! Pendant Park in Tangerine Tango on a scrap of Whisper White. I used Old Olive and Tangerine Tango for the mats. 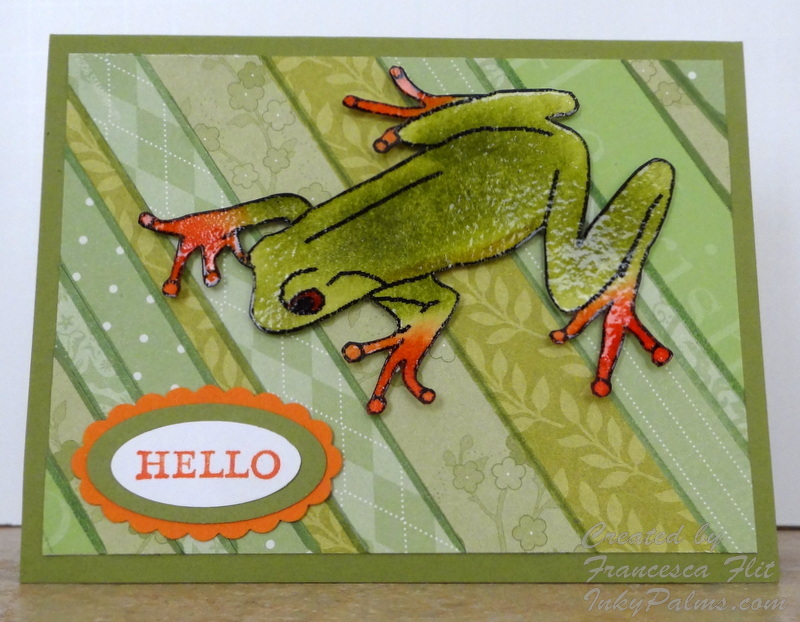 I mounted the background on an Old Olive card base, added the sentiment and then mounted the frog with Stampin’ Up! Dimensionals. I think he is cute, but not as cute as the inspiration froggy! Love this card. The frog is really well done and love all the greens!